I am a mess right now. Completely confused, conflicted, frustrated. Happy, and yet sad. I am so happy the Ducks won, but very sad about what my gut is telling me and what I have begun to express in the comments. I am not going to analyze the game, as I will let Coach Ken Woody and others do that, and I do have the entire off-season to break these games down further. Instead I ask you all to pull up next to me as I lay on my therapy couch and give me your views, wisdom and counsel. Many Oregon fans feel the same as I do and have begun feeling it over the last week, and only now are reluctantly beginning to express it. After another blown assignment in the defensive backfield gave up a second touchdown in the game, I began to wish Nick Aliotti and John Neal were coaching them again. The receiver corps was elite in 2014 and has diminished in talent and skill ever since; they are not improving as a group as they should be. I would take Gary Campbell over any running back coach in a heartbeat, and I try not to think of what Steve Greatwood would do with the current offensive line group. (Hint — the rushing numbers would be tons more). It seems to me that this staff is long on recruiting skills, and short on coaching expertise. I want to claim otherwise, but my eyes and gut tell me different. Yes, this staff is being compared to the past because they stated they can return us to the glory days. But it takes more than recruiting, otherwise USC would win more than they do. 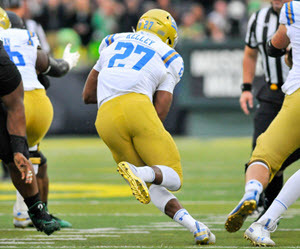 Oregon’s brand, our reputation and trademark was a blur spread offense that scored scads of points. It is what recruits and what fans know us by nationwide, and that offense is being killed and replaced with something much less. Why would anyone change an offense that scored an average of 43 points a game from 2009 through 2014? Why not just add a great defense to that offense? 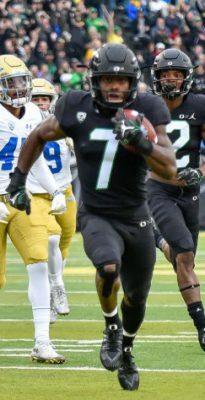 Ugo Amadi’s punt return TD was a big boost for the Ducks. We howled in laughter, and then just about burst into tears thinking about the loss of such fun times. There are many of you who believe these coaches can deliver, and once they have their talent in few years, we will see it. That is my hope and what I will be looking for, in addition to their improvement and growth as a staff. You see, I believe that in most of life endeavors, great talent emerges early. 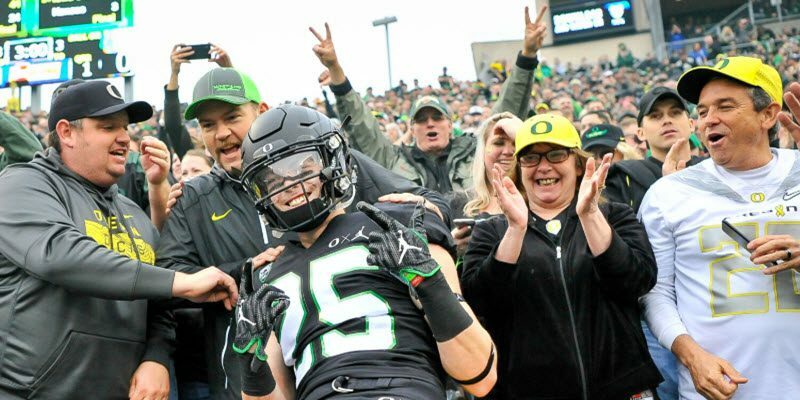 We knew in his first game against Cal-Davis that Troy Dye was something special; ditto for Marcus Mariota in his first game against Arkansas State. 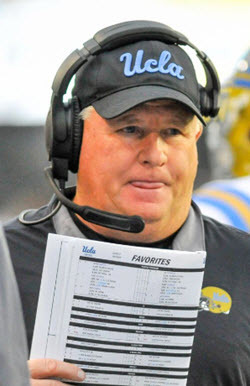 Chip Kelly showed us early as an Offensive Coordinator how good he was, as did Mike Bellotti when he began his time at Oregon as the OC under Rich Brooks. You see it in other professions all the time, and I see it right on this site with writers and even those who comment. You see greatness early, and what I see with this staff is great recruiting; that’s it. But I am a loyal fan who will hang in there regardless and continue discussing it here with you. In the comments of yesterday’s article (which is one of the best set of well written, well thought out collections of comments ever on this site), there was a comment by Ugly Duckling about the concept of who I should be loyal to. I cannot paste it all in here, but it is well worth the time to go to the link and read it. It is one of the most thought-provoking comments ever written on this site, and put me into a pondering state that placed me on this couch next to you as a muttering mass of protoplasm. The negative comments you and I write about the team is being read by parents of players and recruits. I know this because they have called and emailed me. But should I stick my head in the sand as I did in 2016 and just be a sunshine-pumper? On the other hand, such rash commentary (as above) could hurt the team! Who should I be loyal to? The team, the university, the readers of FishDuck.com, or the parents and recruits? I have to follow my gut, my own sense of ethics and the natural law within me in the end. I am no longer sold on the staff and the future and hope that I can be. P.S. These views are mine only, as other writers on this site are encouraged to state their opinions and do. Hence, someone else’s writing may be completely different than mine; we are an All-Volunteer site of those who enjoy writing, pondering our Beloved Ducks and discussing these subjects with all of you in the comments. We are all distinct and do not have an official “site” opinion.